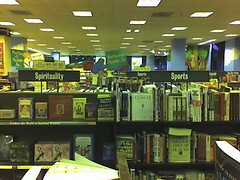 Barnes and Noble are as noble as to show a deep understanding of both sports and spirituality. That is why the bookstands are so close to one another. Thanks for supporting our approach!